South Coast Botanic Garden is located in Palos Verdes Peninsula, California and just prior to this wedding reception, the bride had her dress bustled. She was also fed a cherry by one of her bridesmaids. It turns out that the bride loves cherries and the bridesmaid had a cherry in her drink. Even of the bridesmaid also love cherries, she decided share it with her best friend instead. This is a perfect example of multiple stories occurring within a single photograph which is actually what I strive to achieve every time I pressed the shutter on my camera. 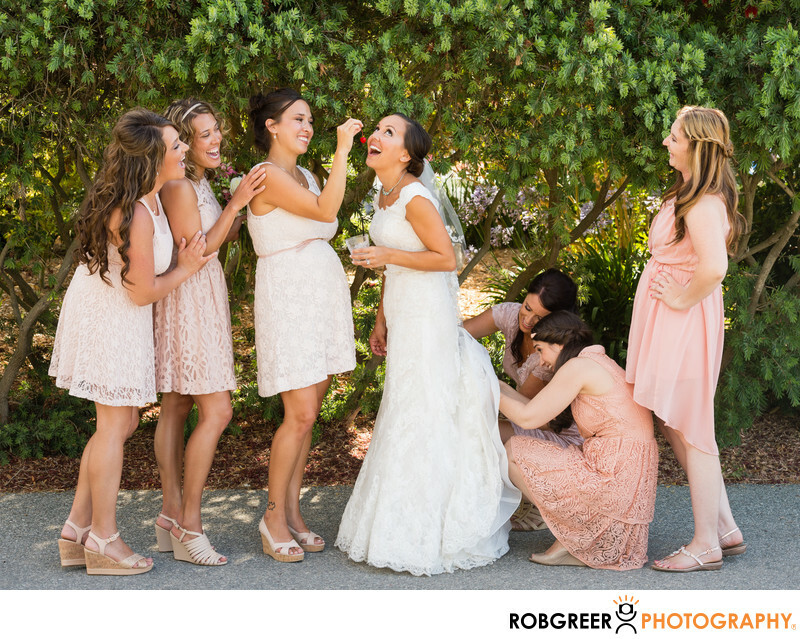 I really enjoy the expressions on the bridesmaids faces and the expected moment right before the bride bites the cherry. I've already booked several weddings in the future at the South Coast Botanic Garden and I can be happier because I love that venue as a wedding location. The diversity of locations available when I'm photographing brides and grooms is virtually limitless. Location: 26300 Crenshaw Blvd, Palos Verdes Peninsula, CA 90274. 1/250; f/10.0; ISO 400; 70.0 mm.